Volunteers at the Ferguson Farmers Market. Chris Jaurigui, Annette Beach and Dave Thies. St. Louisans are fulfilling the promise of the local food movement, which began nationwide in the 1980s. It resurged in the early 2000s with the purpose of sustaining local producers, building community ties and reducing the environmental impact of the food system. 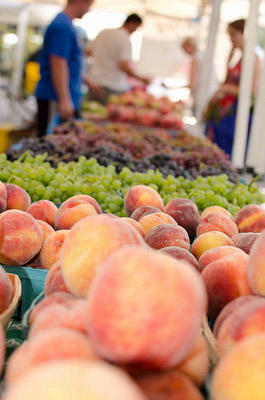 That’s when many local farmers markets and local farms started appearing across the country. Have we reached a saturation of farmers markets? 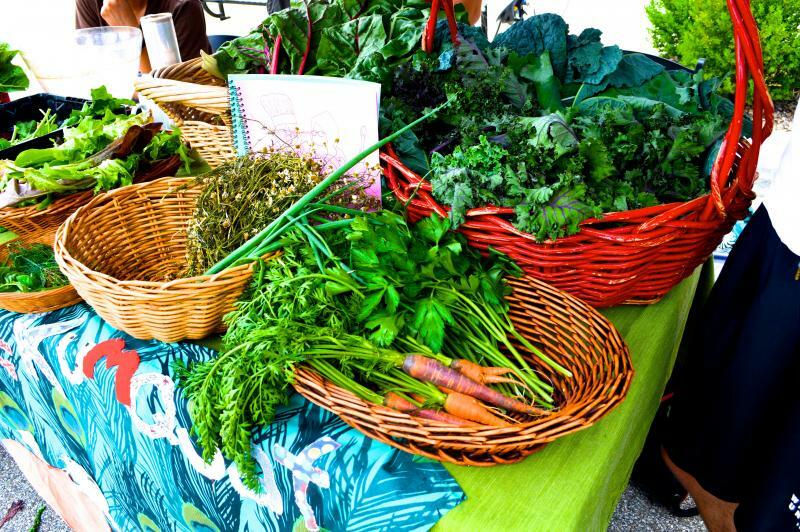 By some counts, there are now more than 30 farmers markets in the St. Louis area, and that’s not even including local/urban farms that sell food in the region. While there is vast interest in buying food from local sources — you’ll see that grocery stores have recently started emphasizing that they carry it — some believe that the St. Louis market for homegrown products is near saturation. Eggplants for sale at Tower Grove Farmers' Market. “If the farmers aren’t making money, they’re not going to come,” Annette Beach, the market manager for the 10-year-old Tower Grove Farmers Market, replied. 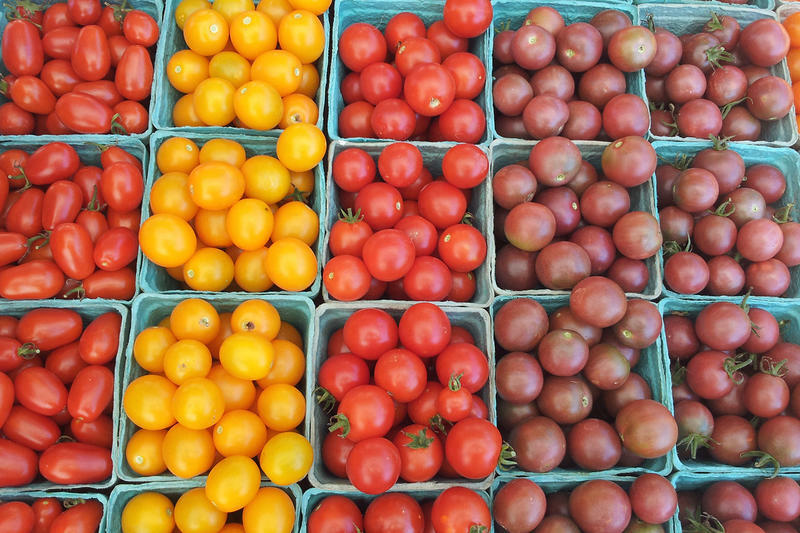 Listen as three people involved in the local food scene chat about farmers markets and local farming with "St. Louis on the Air" host Don Marsh. In the past few years, a few markets, such as Clayton and Ellisville, have shut down their operations due to lack of sales. But that doesn’t necessarily mean that the hunger for local food has waned. We started out 10 years ago with maybe t13 vendors and 500 customers on a Saturday, and now we have up to 60 vendors on a Saturday and we can have 4,000-5,000 shoppers. Thies, whose farm on North Hanley Roadhas been in operation since 1855, and now has two other locations, participates in the Ferguson Farmers Market because it reaches new audiences. He’s also innovated other ways to bring local food to people who are interested in it outside of his farm grounds, where produce is for sale. Thies’ farms bring food directly to customers on a bi-weekly basis to corporations like Express Scripts, Energizer, Build-A-Bear, UnitedHealthcare among others. He says it is a way to get their name out there and also eases the process of bringing goods to market. “In St. Louis County, even as soon as the '80s there was quite a few number of substantial commercial vegetable farms, probably 20 to 30,” said Thies. “Now, as far as commercial farms, you’re talking five. Thies said that the local food movement has even impacted traditional food sources in St. Louis: local grocery stores, such as Schnucks and Dierbergs. “It has really forced their hands to promote local product,” he said, though he wasn’t sure of dollar impact. At markets themselves, farmers or vendors pay a booth fee to participate in the market and then take home all of the proceeds from their day’s sales. One of the hardest aspects of farmers markets is that they are, essentially, community-run to keep costs down. Ferguson Farmers Market has struggled, in particular, following last year’s protests in the area. Jaurigui says it has started to pick back up, but they did have to shut down the market early last fall. A community relationship is cultivated when customers can have one-on-one relationships with the farmers they buy from, said Beach. There are specific vendors that consumers always come to visit. Peaches and mushrooms are especially highly sought, said Jaurigui. Just last week , Beach said that if Joe Ringhausen Orchard doesn’t come to market, she’ll have over 100 people asking her where the apple cider is. Sometimes, at the end of the market, you may even see vendors trading among themselves with food that is left-over from the day’s business. People sit down and enjoy a meal with different people, complete strangers and they strike up a conversation because they have a common interest: the farmers market. That community-creation is part of the reason why “saturation” doesn’t worry Jaurigui. A new program at several local farmers markets will give low-income customers double the value for money spent on fruits and vegetables. This weekend marks the start of the summer farmers’ market season with stalls opening in Kirkwood, Lake St. Louis, and Cuivre River. While these markets are re-opening, the Clayton Farmers Market is not. The North City Farmers’ Market in St. Louis is in a neighborhood where the majority of its residents are African American. It’s been a challenge, however, to attract more of them to the market every week. Community organizers are attempting to change that. Their idea is to feature African American musicians with the hope that shoppers will follow. Held on the 2700 block of North 14th Street every Saturday from 10:00 a.m. to 1:00 p.m., the North City Farmers' Market will take place through October 12.